At the end of February we begin our varmint hunts. Each spring thousands of ground squirrels, fondly called "sage rats" come out of hibernation and begin decimating the alfalfa fields. These little pests make a great target and are sure to improve your marksmanship. Popular calibers for this type of shooting are .22, .22-250, .222, .223, up to 25-06. Bring plenty of ammo, it is not uncommon to fire 500+ rounds a day! 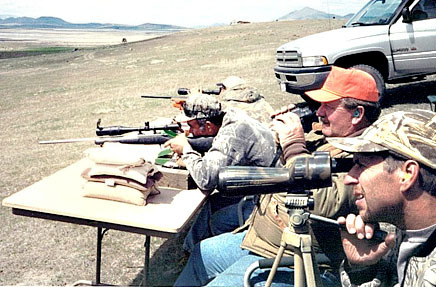 Shooting is done from a raised, portable-shooting bench, giving maximum stability for those five hundred yard shots. Hunts go till May. Contact us for more information or for available dates.